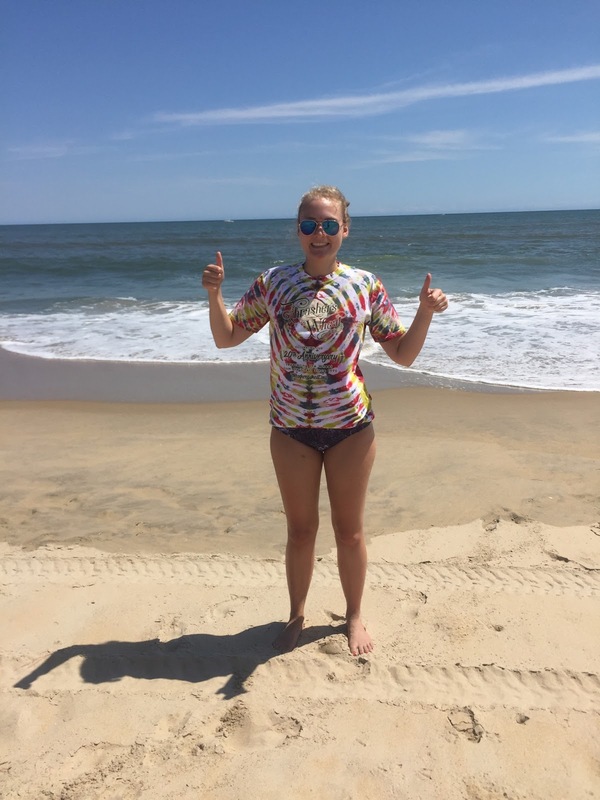 Here is the Shirt of the Moment of our niecette Kristen on the beach in Virginia Beach, VA.
Kristen (longtime, loyal TW fan) flying her colors with a Thrasher's Wheat 20th Anniversary Shirt. And thanks to all who have sent photos so far. We'll have more in the coming days to feature. Also, if you recently ordered a shirt on the 2nd round of Thrasher's Wheat 20th Anniversary Shirts, here is the latest update. The tie dye crew in Hawaii has completed their task and the shipment is on it's way to the TW HQ on the mainland North American continent. And then back out to you good folks. So hopefully we'll have these out to folks in time for Farm Aid/Telluride/Desert Jam/Bridge etc. Won"t look any better- few!! !